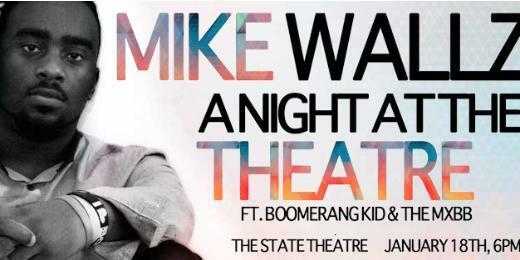 The State Theatre and SafeHouse Productions present recording artist and former Penn State football player, Mike Wallz, in concert on January 18th, starting at 7 pm. The concert will be held at The State Theatre, on College Avenue in State College PA, and tickets are $10. Tickets will be available at http://thestatetheatre.org/, or at The State Theatre Box Offices. Mike Wallz has been making his presence known in the hip hop community for a few years now, and has made a respected name for himself, especially within the Penn State community. Now that he is launching his career as a solo artist, Mike has decided to show his fans at Penn State everything that he has been working on, in concert, at the State Theatre. Mike recently released his first solo album, “The Free Life”, and is very excited to perform it live for the first time on January 18th, in a concert setting that allows him to display his musical abilities and explain some of the concepts behind his music. The event will be entitled “A Night At The Theatre” and will be formal themed. Guests are encouraged to attend in formal wear. Joining Mike Wallz in concert will be Penn State DJ, The MXBB, and Columbus, Ohio based alternative rock band Boomerang Kid. Come out and support the Penn State music scene and enjoy “A Night At The Theatre”.